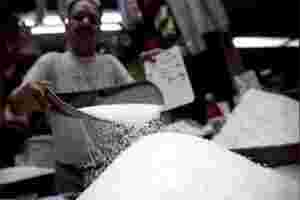 File photo of a shopkeeper with his stock of sugar at a wholesale market in Old Delh. Bloomberg. In November so far, sugar prices have risen by about 7% in the Delhi wholesale market, reaching ₹ 33.12 a kg, their highest level since July 2010. Prospective and current investors in sugar stocks may think this is the rally they were waiting for, for years now. But they should not jump to such conclusions. Another reason may be the likelihood of higher costs for sugar producers. In Uttar Pradesh, the state advised price (SAP) has been raised by about 17%, when sugar prices have not risen. In a conference call, Shree Renuka Sugars Ltd’s management said that sugar mills in Maharashtra wanted to pay 25% less than what they had paid last season. But a farmers’ agitation has reversed that. The sugar industry in Uttar Pradesh says it will make losses at the new procurement prices, contending that their cost of production will be ₹ 34 at the new SAP, while the current ex-mill price is ₹ 29 a kg. But this is only from selling sugar. Mills also make money from selling by-products, including alcohol and ethanol, and co-generated power. In 2010-11, for example, Balrampur Chini Mills Ltd incurred a loss of ₹ 20.3 crore in its sugar segment, but earned a profit of ₹ 25.2 crore in its distillery segment and ₹ 21.6 crore in its co-generated power segment. It earned a total profit before interest and tax of ₹ 26.1 crore (after deducting a ₹ 37 lakh loss in the “others" segment). Sugar companies may go to court and ask for a stay on the government’s diktat to raise prices, continuing to pay farmers based on previously paid cane prices, and wait for a positive outcome. Uncertainty will still prevail on whether the final decision will go in their favour. If market prices go up, however, sugar companies may earn profits even by paying more for cane. That brings back a familiar question: will the government let sugar prices rise? Food inflation remains a problem. Rising sugar prices will only add to it, not something the government wants to see, especially when state elections are due in 2012. So the government is likely to pull out all stops: blocking sugar exports, raising open market releases, reducing stock limits, and in the process flooding the market with sugar, thus, preventing any increase in prices. The uncertainty dogging the sugar industry—and its investors—shows no signs of receding in the near to medium term. More drama will unfold in the coming months, giving investors enough time to react if there is a fundamental shift in the industry’s fortunes.